Jordan Knight Surprises Bloggers at Blissdom Canada in Toronto! There I was. On the dance floor, getting ready to hear Racheal McCaig sing her first karaoke song of the night. It was the Blissdom Canada annual Halloween karaoke party. The words that first escaped Racheal's mouth, however, were not what I was anticipating. "Yes, that's Jordan Knight over there." What? Jordan Knight?!? Over where? Surely, it must be someone disguised as the New Kids on the Block star. It was true! 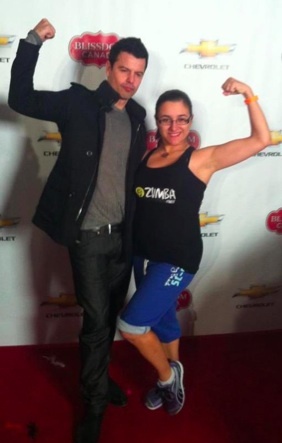 Jordan Knight was in the house! Eeek! Shortly after that announcement, the room emptied nearly immediately as all the women-turned-12-year-olds lined up for their exclusive photo opp, each donned in their costumes. What a sight! And of course, there was Eric Alper handing out Jordan Knight's latest CD. Awesome! Jordan Knight and myself at the Blissdom Canada karaoke costume party. Later, Jordan joined us for some karaoke à la NKOTB while his adoring fans joined him on stage. Including myself. Pinch me. I must be dreaming. Check out this video on CBC Live. How fun was that?! Congrats to you, looks like it was a blast. One of these days I'll actually make it to Blissdom. It was crazy fun! I highly recommend you go to Blissdom. Maple Leaf is sponsoring someone to go next year. Just sayin'. "1 tweet can win u a sponsorship to #BlissdomCanada '12 from Maple Leaf Foods! #MLFbliss"
Love it! :-D Glad to see you had a super time!